After days of preparation, the day has finally come. 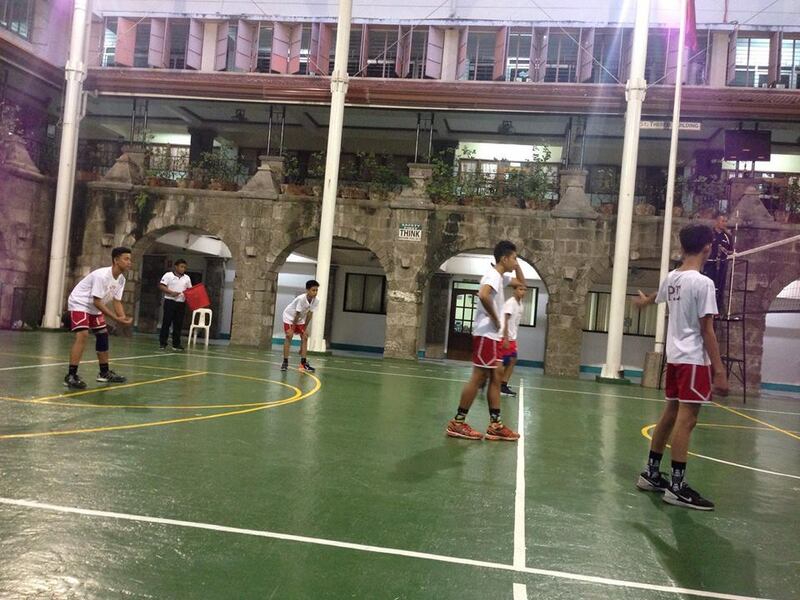 Last July 14, 2017, at 6 o’clock in the evening, the first game of the Volleyball Boys was held at Pateros Catholic School with PCC’s volleyball team during the PaDSS Friendly Games 2017. The players who participated in the game were the following: team captain, Ric Clarenz Pascual, JP Casas, Mark Marcelino, Axle Casas, Eugene Intencion, Khyle Norman Bautista, Lourence Legaspi, Marco Catacutan, Meljohn Vedad, Ralph Catamora, Sam Formalejo, and Nico Ramirez. They were cheered and supported by their coaches, Mr. Joel Yacap and Mr. Carlo Mercado; Ms. Kathrina May Ariem and Mrs. Joan Binwag; and four Grade 10 students, Bianca Mariquina, Cled Buenvenida, Trisha de San Jose, and Vanessa Rogel. The first set ended with the score of 7-25, in favor of PCC. Even when they lost in the first set; they still continued to enjoy the game for the glory of the school. The game ended after the 2nd set with the score of 17-25, still PCC’s victory. “Maganda naman ang laro kaso hindi pa naman nila masyadong alam kung paano maglaro ng volleyball. Pero kahit ganoon, nagawa pa rin naming makapuntos mula sa kalaban namin at nagawa rin namin, kahit kaunti, ang positioning namin. Kaunting practice pa at magagawa na namin ito ng maayos. Ang dapat naming iimprove ay ang receive at service namin kaya magte-training kami ng maayos at gagalingan namin sa susunod naming laban.” stated their team captain about their game. The team did not take its loss with a heavy heart. Instead, they smiled and thanked their opponents, the officials, their coaches, and most especially, God for the blessings of time and skills shared by all to bring the first game to fruition. Last July 7th of 2017, Sto. Tomas de Villanueva Parochial School celebrated the First Friday Mass of Sto. Tomas de Villanueva Parish. 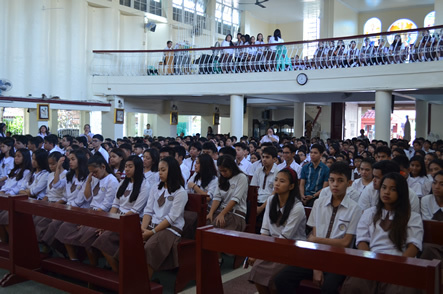 The Flag Ceremony led by Grade 10 students was held inside the church before the Mass. For the First Friday Mass, we paid tribute to the Sacred Heart of Jesus. It was also a Thanksgiving Mass for the School Principal, Dr. Marcella D. Bejado’s birthday last July 6, 2017. The Mass presider was Rev. Fr. Darwin L. Calderon, Chaplain of the school, with Ms. Gina L. Bagtas, STVPS Christian Living teacher, as the commentator. The First reading was read by Ms. Pearl Angelica H. Recio, the School Secretary and the Responsorial Pslam was sung by Krisjane Yumi V. LAuc, an STVPS Grade 7 student. After Rev. Fr. Darwin L. Calderon’s Homily, the oath-taking of the elected officers Supreme Student Government for the school year 2017-2018 began. The SSG Officers were applauded by fellow students as they were called one by one to go in front of the altar to take their oath. They pledged to fulfill their duties, protect the constitution of the school, implement the rules and serve the school and the parents. They were blessed by Rev. Fr. Darwin L. Calderon. After the Mass, Dr. Marcella D. Bejado was also called to the front of the students of STVPS. The students, then, greeted and sang to her a happy birthday while she was receiving birthday cards and flowers. Our school principal thanked all of the people who were a part of this warm gesture. Sto.Tomas de Villanueva Parochial School celebrated the feast of Saint Peter and Saint Paul at the STV Parish last Thursday, June 29, 2017. Rev. Fr. Darwin L. Calderon presided over the Sacrament of the Holy Mass with Mrs. Rechelle S. Carolino, CL teacher, as the commentator. The following also joined the celebration as the rendered services at the Holy Mass: Roanne Aurel S. Paro Cruz, STVPS student and Ms. Carleen Anne M. Huab, STVPS guidance counselor, for the first and second reading, respectively. Ms. Norida B. Manginsay acted as the Master of Ceremony. Ms. Joy Anne Puazo led the community to the Opening Prayer which was followed by the singing of the Philippine National Anthem conducted by Mr. Drean F. Sabuco. As part of the awareness program of the school, the Santo Tomas de Villanueva Parish Credit Cooperative was given the chance to promote its new programs and encouraged the parents to help their children save for the future. Bro. Arturo Santos, Finance Staff of the School and the Representative of the Parish’s Family and Life Ministry was given the chance to invite couples to marry in the church as one of the major activities of the parish prior to the Fiesta. He also invited grandparents of students to join the Grandparents Organization as springboard to establishing the Grandparents Ministry of the Parish. Dr. Leo B. Galve discussed briefly his directive for the school year. It includes the information on the signing of promissory notes, the 5% penalty, the updates on Field Trip, the restriction of parents to enter the classroom during lunch time and the observance of dress code in the school. All these were discussed after the audio-video presentation featuring the school personnel. Dr. Marcella D. Bejado presented few salient points on the latest updates of DepEd. Among those that she discussed include the grading system, the awards system, and her personal reflections on the theme of PaDSS. She ended with the hope that parents and school will have a healthy partnership through the school year. Some reminders were provided by Mr. Christian B. Santos on policies as regards Student Handbook and Ms. Maria Imelda M. Balabat on SchoolDex and Educational Service Contracting program of Private Education Assistance Committee through Fund for Assistance to Private Education. To provide parents with a flashback of their participation to the programs of the school, Mrs. Marilyn Vasquez, PAC President, presented the projects involving the PAC officers likewise the Financial Report by Mrs. Elsa Cruz, PAC Treasurer. The total count of the attendees reached up to 530 parents from preschool to grade 10. At 9:00 a.m., parents were directed to proceed to their respective classrooms in the school for the election of parents’ officers and other important reminders. Kudos to parents who took time to be informed about the policies, rules and reminders of the school. May God bless us all! They are the officers who will do their duties and responsibilities for the school year 2017-2018. They were cheered and congratulated by the students and personnel. Copyright ©July 7,2011 .All Rights Reserved.